Exhausted chefs are headed to the Grand Ole Opry for their Quickfire Challenge today. It’s an odd sight indeed to see eight cooking stations onstage in a big music venue. It reminds me a little of Iron Chef America, or maybe The Final Table on Netflix. The chefs are tasked with putting together a dish for one of country music’s “most exciting rising stars,” based on the menu requests in the artist’s contract riders—obligations that the music venue has to satisfy for the arriving artist—for breakfast, lunch, and dinner. It’s a fun challenge, with a barebones theme and just enough flexibility for the chefs to show off. Most of the focus during the challenge is on Adrienne. Yes, she’s still incredibly sick (last week’s houseboat challenge cannot have been fun for her) and she even had to call a halt to the 150-minute car-ride from Kentucky to Nashville so that she could . . . expel some food due to a combination of carsickness and actual sickness. She manages to pull together her dish, which she knows is well-cooked, even if it isn’t the most original or attractive looking dish. Hey, what do you expect from someone whose mind is clouded by Sudafed? The guest judge for the Quickfire ends up being Louisiana-native Hunter Hayes, who elicits a high-pitched squeal of excitement from Kelsey, who’s been a fan of his since she was 14 years old. Padma had pitched him as a “rising star,” so given that Kelsey must at least be in her early-to-late twenties, I’m not sure how long he’s been rising. But onto the food. The breakfast chefs go first. David has a classic French omelet with a goat cheese vinaigrette, which Hunter deems nice and light. Eric, taking an apparent due from Ina Garten and her “Sunday Morning Oatmeal,” makes oatmeal with maple syrup, brown sugar, fresh fruit, and a raisin jam. Kelsey does a take on one of my favorite breakfasts of all time, shakshukah, but with eggs and toast. Unfortunately, the eggs don’t look runny at all. Lunch is next, and Sara has a cauliflower salad with radishes, blueberries, and blackberries. Hunter likes that we’re getting a healthy option. Eddie similarly has a shaved vegetable salad with chicken and prosciutto . . . though if you have chicken and prosciutto, is the salad really still healthy? Finally, rounding out the salad lunches, Michelle has a grilled cheese salad with avocado buttermilk vinaigrette. These chefs are really pushing boundaries when it comes to salad. Justin and Adrienne round things out with dinner. He has a skirt steak with vegetables, kohlrabi, and cremini mushrooms, while she has a seared filet mignon with Cajun spiced corn and a roasted red pepper puree. Though Hunter declares himself “blown away” by the chefs’ offerings, three bring up the back of the pack. The sauce on David’s omelet overwhelmed the egg flavor, and Hunter wishes David hadn’t gone so fancy and chosen instead to do a more typical egg preparation. In Eddie’s salad, Hunter finds that it all had the same flavor profile. Finally, Kelsey didn’t find favor with her shakshukah, as Hunter doesn’t really like acidic things. Seems like Hunter ranks a bit lower on the “foodie” spectrum. Better news comes for Eric, whose oatmeal was light, refreshing, and nicely sweet. Sara did a great job with her cauliflower, which was savory, sweet, and balanced. Adrienne also makes the cut with her meat dish, which was well-prepared and balanced a ton of ingredients that Hunter personally likes. Despite being sick as a dog, Adrienne ends up winning—her first individual win on the show. Continuing with the music theme, Padma riffs on the idea that music plays an important part in our lives and can create really lasting, powerful memories. For the Elimination Challenge, the chefs will have to take such a musical memory and then make a dish based on it for a diverse set of diners—from James Beard Award-winning chef Sean Brock, to the legendary chef Jonathan Waxman, to the lead singer of the Kings of Leon. The chefs will get two hours today, and then two hours tomorrow—save for our Quickfire winner, Adrienne, who’ll get an extra hour tomorrow. The challenge starts evoking a ton of different memories (though not necessarily musical memories) for the chefs. Adrienne thinks about when she was missing home while working in New England, David reminisces about his time cooking in Portugal, Kelsey and Eddie think back to dishes that remind them of their spouses . . . but no memory is as moving as Michelle’s. She was named after the Beatles’ song, “Michelle,” and has incredibly fond memories of working in the garden with her dad, who took his own life when she was fifteen. She wants to make a dish that pays homage to her dad, her time with him, and everything he taught her. The chefs complete the requisite sprint through Whole Foods and two hours of prep. The biggest drama is with David, who really seems to be struggling. Though he wanted to do a take on this traditional Portuguese dish featuring braised octopus, Whole Foods only had frozen octopus, which clearly won’t work. Instead, David buys clams, which he plans to pair with pork, but the clams aren’t the size he typically prefers—these take longer to open up, they can get really rubbery, etc etc. He’s trying to roll with the punches, but he’s getting a little short-tempered and punchy. One wonders where his head is going to be at the next day. Thankfully, the chefs get to take the night off, relaxing back in an amazingly opulent sweet in a Nashville hotel with a gorgeous view of the city. Memo to self: go explore Nashville at some point. The city looks amazing. The next day, Adrienne uses her extra hour to get herself as organized as possible for service, and the other chefs finish up their dishes, though not without some difficulty. Eric is up first but gets so behind in preparation that he has to call David over to help plate his dish. His dish is inspired by the breakfast dish the Notorious B.I.G. rapped about in “Big Poppa,” presenting a ribeye steak with eggs, parmesan cheese sauce, and a concord grape jus. It’s a bit far removed from the Brooklyn musical roots, but it’s good, though Tom notes that Eric’s meat is overcooked. Justin is excited to present his Prince/Purple Rain inspired dish of NY strip loin with braised red cabbage, a beet potato dumpling, and purple pearl onions . . . only he realizes on his way to the dining room that he only plated 9 dishes and not 10. Disclosing that fact at the outset, Padma instantaneously responds by informing him that he is officially ineligible to win the challenge. Wow Padma, you don’t even got to consult with the other judges about that? LOL. You gotta love a woman who takes charge and makes the call. Ineligible as he is, his dish is a hit. It deftly balances what would normally be very extreme flavors, and Tom appreciates the saltiness of the sauce, which is strong but necessary to offset the sweetness of the other ingredients. Eddie is next with a riff on the first dish he ever made for his now-wife (it surprises no one to learn that, in total Eddie-fashion, upon learning that his wife didn’t like red snapper, he made her red snapper), based on a song by Cake. It’s red snapper with an edamame puree, charred green onions, bacon relish, and puffed rice for texture and to recall the dish’s origins as risotto. The dish is lacking overall—lacking texture, lacking acidity, and lacking a crispy element, as the puffed rice has become soggy with olive oil. Michelle presents her Beatles-inspired dish, which has red snapper, a corn and fava bean ragout, citrus vinaigrette, and a fennel onion puree. She describes her memories of being with her dad in the garden and starts to tear up. Padma asks whether her father is still alive, and Michelle discloses that he took his own life about a decade ago. Padma notes that the dish is an incredible tribute to her father, and Tom roundly praises its use of acidity, sweetness, and texture. It is, he declares, the best dish served all season so far. Meanwhile, back in the kitchen, David’s sauce has overreduced and is quite salty. To counterbalance it, he throws in some butter, hoping the fat will mask the salt. Inspired by an Incubus album, he has a spin on pork with clams—a clam salad, crispy potatoes, and a pork tenderloin. Errors abound. The dish is incredibly salty, multiple elements are distinguishable from the general mush on the plate, the mushrooms are way too soggy . . . it’s, in short, not good. Kelsey has a deconstructed chicken pot pie, with vegetables and chicken plated in the semblance of a ring of flowers sitting atop a lake. She encourages the diners to spoon gravy over the dish to their own liking. As pretty as the dish looks, the flavors are off, as every component—the sauce, the eggs, the vegetables—are all too salty. Graham runs his finger along the plate and picks up flaked salt, like a rimmed glass for a margarita. Sara hopes for a better reception with her gumbo and Hank Williams-inspired gumbo. She has grouper with a sassafras bone sauce, braised greens, and pumpkin-seed pesto. Graham declares it to be some of the best food from Sara this season, finding the sauce to be the essence of jambalaya. Adrienne finishes things off with a New England dish of fruits de mer, with summer vegetables and a corn nage. It’s supposed to evoke memories of Adrienne’s time when she was cooking in New England, far from home and family. The dish confounds Jonathan, as there are components he really likes and really doesn’t like—like the nage, which should be butter infused and not a butter sauce, like what’s on the plate. The lead singer from the Kings of Leon generates a hearty round of laughter by exasperatedly noting that any dish featuring nage should have been inspired by Nicki Minaj. For the most part, Tom tells the chefs at Judges’ Table, the food was very good. The best came from Justin, Michelle, and Sara. Ineligible Justin cooked his meat perfectly, incorporating umami, heat, and saltiness to balance the sweetness of the other ingredients. Michelle’s dish was thoughtful, entirely in the spirit of the challenge, and well-constructed, with each component serving a distinct purpose. Tom tells her he wouldn’t change a thing. As for Sara, her gumbo-inspired dish looked simple was incredibly complex, with its complexity revealing itself more and more with each bite. To no viewers’ surprise, Michelle wins her second Elimination Challenge for her evocation of personal memories and flawless execution. Is she showing herself to be a quiet, self-effacing dark horse for the title? A few dishes, Padma says, hit the wrong note (showing that women can also make really bad Dad jokes). Eddie made a bad decision in butter-poaching his salmon, which lent an oily, greasy texture to the dish. Beyond that, his sauce and fish were both mushy, leading to them being indistinguishable once plated. The use of the puffed rice also confused Jonathan Waxman. David is also on the bottom, as his sauce was overreduced and too salty. Tom wasn’t able to distinguish between his components, and the clam salad was rubbery and similarly mushy (notice a trend yet?). Finally, every component in Kelsey’s dish was salty—her gravy, her egg, her vegetables . . . Jonathan Waxman unflatteringly compares it to the Dead Sea. So we have one texturally-challenged dish that lacks creativity, and two dishes done in by their overuse of salt. Which one merits elimination? Unfortunately, it’s David today due to his sauce and salt. As Tom bids him adieu until Last Chance Kitchen, his fellow chefs wish him luck, noting his reputation as the Quickfire King. 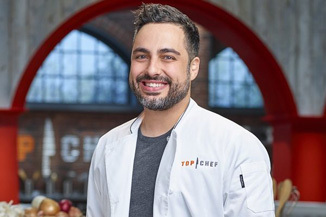 We’ll have to see if he’s able to keep his run on Top Chef going a little bit longer.